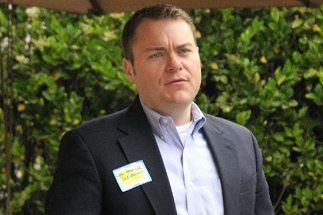 Carl DeMaio announces bid to challenge Democratic freshman Congressman Scott Peters. “If we want better results from Washington, we have to change the people we send there and impose new rules to govern the way we operate,” said DeMaio in a press release announcing his candidacy. Okay, so Congress is broken, and the reason it’s broken is the Tea Party insurgents have taken the rest of Congress hostage, so the solution, according to DeMaio, is to send more Tea Party types to Washington. “As a budget expert, DeMaio will outline cost savings to help balance the federal budget….” reads the release. His plan would presumably entail the same cuts, the same approach taken by Paul Ryan, the current Republican budget guru whose “Path to Prosperity” imposes draconian cuts to the government—and particularly Medicare—but fails to bring the budget into balance for nearly 30 years, if even then. But this is the kind of “responsible” approach DeMaio believes will solve all of our problems. There’s a lot of lip service to “balancing the budget,” but no real intent other than to stifle government’s ability to function. I don’t suppose it might have crossed Mr. DeMaio’s mind that a better approach might be the one taken by the last president to preside over a budget surplus in this country. 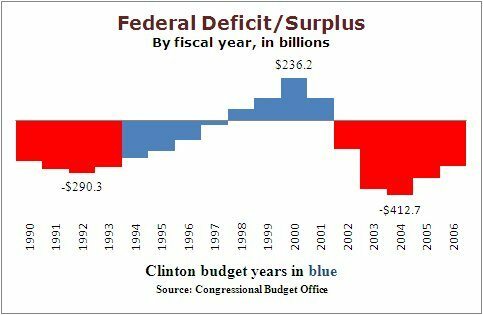 Bill Clinton’s budgets led to a $236 billion surplus in 2000, largely through a slightly higher tax burden on the super wealthy. It was the Bush tax cuts that put an end to that surplus and gave us the huge deficits that have begun to steadily shrink during the Obama presidency. The wealthy weren’t doing too badly back then, either, but it was the middle class that was as strong as it has ever been, which is the key to strong economic growth. Rich people don’t drive the economy, the middle class does. “….and champion pension reform legislation to help fix state and local budgets.” Like the one that sent the City of San Diego from a projected budget surplus into a $40 million deficit in the upcoming budget year. DeMaio insisted that the switch from a defined benefit plan to a 401(k) style plan would be the principle driver that would save the city nearly $1 billion in pension expenses. What DeMaio to this day refuses to acknowledge is that his obliteration of the pension system as we know it actually cost the city $40 million more in pension liabilities just this year alone. DeMaio refused to acknowledge a basic mathematical fact: The entirety of his projected $963 million in savings from Prop B would come from the pensionable pay freeze that is (illegally) mandated in the law. California state law requires that all public employee salary issues be collectively bargained, and clearly states that changes to employee pay cannot be unilaterally enforced, and cannot be determined by popular vote. Yet that’s precisely what Prop B did. All of that was rendered moot earlier this week when Mayor Bob Filner announced a five year labor agreement with all six of the city’s public employee unions that instituted a 5 year pensionable pay freeze that will ultimately lead to Prop B fulfilling most DeMaio’s promises. Without the agreement, no pension savings. And because the agreement came about through negotiation and cooperation with the unions rather than demonization, it’s unlikely that it would have happened via the bully tactics of a DeMaio led administration guided by the premise that public employees are the problem and not even a part of the solution. The truth is that San Diego’s public employee pension system was broken, by City Councils and mayors past through the deliberate underfunding of the system to meet other desires. But that problem was fixed through reforms instituted by more recent councils, and the pension system was largely back on solid footing. Prop B was an entirely unnecessary step designed to disabuse San Diegans of the value of the services public employees provide to city taxpayers. DeMaio’s aspirations are buoyed by a recent GOP sponsored poll that showed DeMaio running ahead of Peters 49% to 39%. One has to wonder, however, whether this was the same polling outfit that the UT-San Diego cited when they declared that DeMaio held a similar 10 point lead over Bob Filner in the waning weeks of the San Diego mayoral race. DeMaio does also have a Republican voter registration advantage of 6,500 in the district going for him, although there are also nearly 112,000 Decline to State voters (although DTS voters are typically more conservative). Still, it would seem that DeMaio will have an uphill battle trying to convince a district that just ousted a conservative Republican with a long history in Congress to elect an even more conservative candidate who has proven to be one of the more polarizing figures on the San Diego political scene. “I see myself as a ‘new generation Republican’ who wants to challenge the party to focus on pocket-book, economic and quality of life issues in a more positive and inclusive way.” Just like the rest of the Tea Party, as DeMaio fits right in with that crowd—the anti-tax, anti-government, trickle down gospel folks. The 2014 San Diego congressional races just got a whole lot more interesting. The 52nd District race in 2012 was among the most expensive in the country, and given that DeMaio is a direct Karl Rove disciple, expect the same—or worse—this time around. Every time DeMaio uses the word “reform” he needs to be challenged. He wouldn’t know a reform if it bit him…. DeMaio in the race is almost a Guarantee that the moderate Peters will get a second term. Moderates are NEVER my first choice but reactionaries are always my LAST! DeMaio comes across as both stale and old news. That doesn’t mean that he won’t be well received by Republicans, but it may be a heavy lift with voters in San Diego. Some Democrats supported him during his mayoral bid and I don’t see that happening this time around. I wonder how the bible thumping, gay hater Republicants in Congress would react to a gay Congressman in their caucus? Just a note: I know that this is a partisan piece…..much more partisan than I originally intended it to be. But Carl DeMaio just gives me the creeps…..the thought of him representing San Diego in Congress just gives me the willies…..he is about as slimy and slick as they come. Talking out of both sides of his mouth just comes naturally to him. So I just couldn’t help myself in this case. Hey Guys, I just looked up the word “megalomaniac” in the dictionary, and guess whose pictures is there? -Yeah, right. First term congressman? That’s a back bencher who votes the way he is told, or he will not be a second term congressman. Funny enough it takes a few terms for him to ever get the clout to see if he was good for his word or not, but he’s never going to get that clout without joining the good ‘ole boys club of graft and corruption. That really speaks of how broken our system of government has become. Pity the constituents of the district that actually do elect a representative who is honest and doesn’t participate in the hand-in-the-till status quo. His district will be cut out of most significant federal spending projects and contracts as his colleagues shun him for not playing ball the way they play it. This is also why horribly corrupt congressmen get re-elected time and time again. As long as the federal dollars flow into the community faster than the last guy, why should the voters care if he’s somehow skimming off the top? It makes you wonder if the days of monarchs weren’t more productive and efficient than this democracy thing. At least some of them approached the task with some sense of honor. That is 100% correct but it’s a grave mistake to assume this could happen again or was even remotely a good idea. That era in fact saw the exodus of manufacturing jobs leave our shores to be replaced by Chinese factories. It wasn’t by accident, the corporations doing this sent their engineers to China to hand them manufacturing knowledge that would be called industrial espionage if you quit your job and took it to a new employer. As the factories here closed the stockholders reaped enormous short term profits and naturally paid a tax on those earnings. It’s fallacy to believe Clinton’s policies created capital for this country- when what it really was was the selloff of brick and mortar assets and intellectual properties. (and ultimately was the cause of both the mortgage debacle and the wall street crisis) Blame Clinton or the corporations or whoever you like but do please understand why this is not something to cite as a success story. This was a wonderful piece. Thanks. I hope to see more from you Andy. I like your style and your analysis.